Drowning in a world of multi-tasking and stress? A virtual assistant can help you with that. How many times have you stared at your inbox, or shuffled the piles of paper on your desk and thought, “I’m drowning in things to do! ?” Or maybe you bravely make a to-do list each Monday, knowing full well that by Friday it will have doubled, and you’ll have nothing but anxiety and a clenched jaw to show for it? Welcome to the world of multitasking, over scheduling and stress. Fortunately, we have some good news for you: there’s hope. You can find solutions, relief and maybe even a good night’s sleep in the form of a virtual assistant. Technically, a virtual assistant (also known as a VA) is someone who remotely provides professional services to clients. They are usually self-employed, and offer technical, administrative, or creative support and assistance. And they can make your life a whole lot easier. Travel research and arrangements: have your VA research on destinations, hotels and fares, specify the details and present you with the top options. Email management: if your inbox is insane, ask your VA to give it some structure, delete spam, sort messages by topic and highlight emails that need your attention. Even better, have them set-up projects in your online collaboration software. To-do lists: have your VA review your calendar and online task management system, and ask them to type up a daily to-do list. Appointment setting: save time by having them set up your personal and business appointments. Ordering supplies: develop an office supply inventory spreadsheet. Instruct your VA to order supplies and track inventory (and spending) as needed. Professional reading curation: give your VA a list of keywords and ask her to search for related blog posts, articles, podcasts and videos for later review. Bookkeeping: let your VA handle paying the bills, issuing invoices and other bookkeeping tasks. Business research: most important business decisions require time-consuming research. Your VA can conduct the initial steps and, if appropriate, prepare reports. Proofreading and editing: self-editing is difficult. Have your VA review your blog posts, letters, press releases and other publications for errors. Collections: slow or non-paying clients cost time and money. Assign the collections process to your VA.
PR logistics: your VA can serve as your press release contact person. He can field basic inquiries and set up appointments with the media. Presentation development: send your notes to your VA and ask her to convert them into a PowerPoint or other type of presentation. Content development: is your VA a talented writer or artist? Make use of those talents by asking him to produce content for your business. Social media updates: your VA can update your social media accounts and respond to communications. Mailing list management: do you have struggle with e-newsletter or mailing lists? Delegate the responsibilities of updating lists, sending out mailings and collecting analytics to your VA. Obtaining quotes: need to purchase a product or service? Your VA can request quotes from suppliers on your behalf. Hiring: your VA can place job ads, sort through applications and help you check references or run background checks. Reputation defense: ask your VA to search the web for mentions of you or your company. If she spots negative content, she can notify you so that you can address the issue. Image sourcing: if you regularly use images in social media or blog posts, you’ll need a consistent flow of fresh, relevant images. Your VA can hunt these down. Affiliate program management: successful affiliate programs need attention.Your VA can help by keeping affiliate promotions updated, monitor analytics and answer related questions. Website updates: your VA can update your websites with fresh content, make corrections and manage links. Blogging: regularly updated blogs get more readers. Have your VA post relevant content when you don’t have time to write a post. Document management: ask your VA to organize scanned and online documents into folders, making it easy for you to find what you need. Charitable giving management: your VA can research charities and provide you with information so that you can choose which charities you wish to support. VAs can also field requests from charitable groups who would like you to sponsor their events or activities. Personal shopping: have your VA do your personal shopping online for you. Of course not all VAs will be able to do all of these things, and some of these tasks require a high level of established trust. So before you hire anyone, take the time to carefully evaluate each candidate’s résumé. Having a good understanding of his abilities from the start will help avoid unnecessary conflict and frustration for both parties. It’s also important to make sure that your VA has undergone a background check, particularly when they will be handling financial transactions, sensitive projects, mailing lists or confidential online files and web properties. 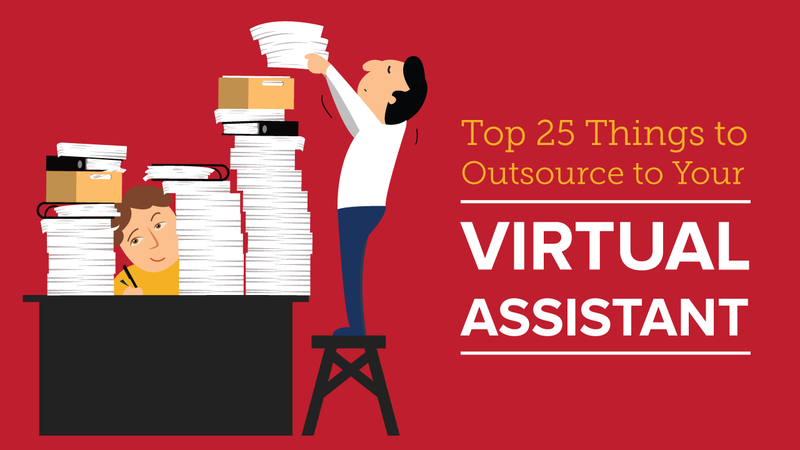 Are you considering hiring a VA to help relieve your heavy work load? What are the primary areas you need help with, and were they included on this list? If not, we’d love to hear about what it is that you’re looking for. Add to the list, and tell us your stories!